Launched by the Pope Benedict XVI, the year of faith has to prepare God’s people to celebrate the 50th anniversary of the convocation of the Vatican II Council by the Pope John XXII. This special year has helped many people to reflect upon their faith, this fundamental Christian seed that pushes us forward and nourishes our hope with a strong conviction in unseen good things to come. Gratitude is due to the Pastors of the Holy Catholic Church for leading people into the Light of faith, helping every person to understand its meaning and to live by it. Due to his voluntarily resignation from papacy some months ago, the year of faith has been concluded by another great figure of the Church, Pope Francis, who in the meantime launched the year of laity. Basically, Faith is a response to God’s revelation through Jesus Christ. It has a total and deep meaning since humankind began personally encountering with Christ. As stated above, faith is an important component for our Christian life and our being Jesus’ disciples. In many episodes in the Gospels, Jesus is urging his followers to only have faith in him. The great value of faith is shown through and through in the Letter to the Hebrews wherein the dead are still alive through their faith. Faith requires humility from us and this raises a couple of questions in my mind: how to enhance the intensity of being humble for oneself and others? How to channel one’s heart to the mystery of the unknowable? Then, how to truly cooperate with the reality of salvation? The salvation is already present now and here. Received, it has to be spread and shared among the whole humankind. What is needed is to abide to the truth that lays at the very center of our existence. 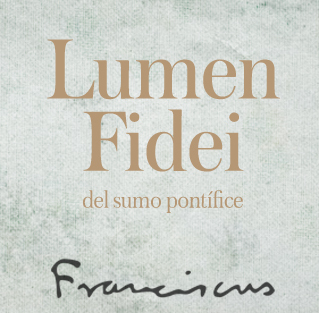 In the second chapter of Lumen Fidei, Pope Francis states, “Unless You Believe You Will Not Understand.” In this statement, we find the importance of faith which leads to understanding evething and to have another vision of whatever happens to us. Through eyes of faith, what the world regards as useless, wasting of time and resources, acquires a new meaning and becomes a new way of life. It is not surprising then that Saint Paul affirms loudly that it is not me living anymore, but Christ living in me. So, with him I learn how to regard the worldly things as less important. The Loyola School of Theology (L.S.T.) has also formally celebrated the closing of the year of faith through a symposium that sought to relate Pope Francis’ encyclical with the practice of Christian faith in Jesus Christ in its creedal (believing), moral (living out), and worship (celebrating) aspects. For this task, L.S.T. has invited Most Rev. Socrates Villegas, D.D. Archbishop of Lingayen-Dagupan and President of the C.B.C.P to honor the day with a wonderful talk. Referring to the criteria of faith, the experience of the earlier Christian community has power to refresh the reason of faith related to humanity living the today world. Again, it has to do with the Creed: symbol of faith par excellence. When we say “I believe in the almighty God,” we recognize the power to perform even the impossible. Individually and commonly, Faith is a sharing and witness about experience of confidence. According to the Archbishop SOCRATES, the creed has to be re-proposed, rethought, suggested with freedom and lived out through daily concrete life. Hence, for him the creed must be not merely proclaimed or preached but initially handled with humility, through humility and in humility, (L.S.T. Symposium on Nov. 20). As a response, nowadays, the Crisis that scrabble our society is not so much the happenings related to politics, economics and anthropological events; not even the lack of Faith, freedom and good will. But it relates more to our minimalist witnessing and the Christian’s (priests, religious and laity) insufficient humility in confessing the Faith. Starting from this point, humility considers all, understands all and supports even the unbelievers to partake from the humanity of Christ. The end of the year of Faith should challenge us to respond to the call of Faith, enlarging the horizons of our vision so to include the whole world, enhancing our capacity for acceptance of others even if different from us, able to understand those who have other worldviews. All of this without losing sight of God’s greatness and might from which people depend on. With the certainty that God is open to welcome everybody in his Kingdom as a true King who shapes and rules our lives, let us ask for the grace of a strong faith. Advent: Time to prepare Christmas Gifts! Really?